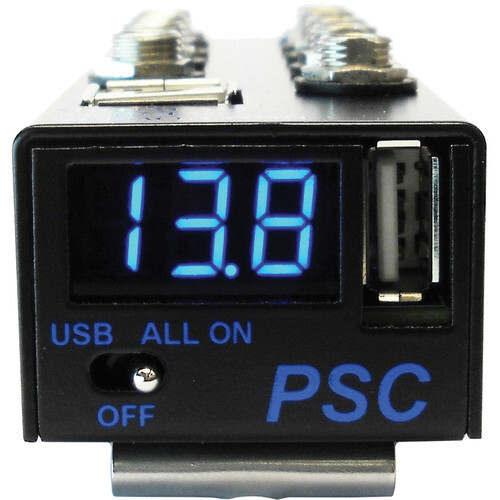 The new PSC PowerStar Mini Triple Play power distribution system provides a convenient way of distributing clean, quiet, reliable 12Vdc power to all of your ENG Bag and Small Cart based audio equipment from one or more rechargeable batteries. 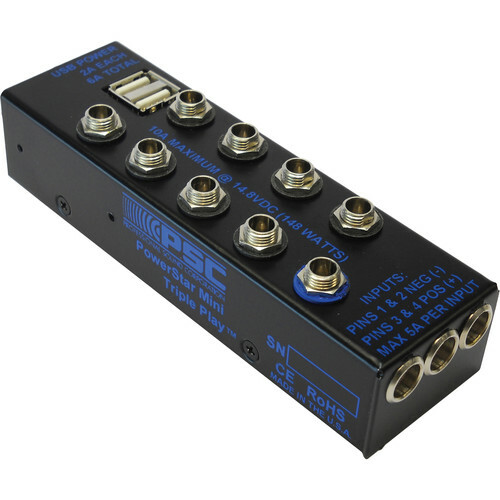 The PSC PowerStar Mini Triple Play features nine main outputs. Each of these outputs is designed to deliver up to 2 amps of continuous current. 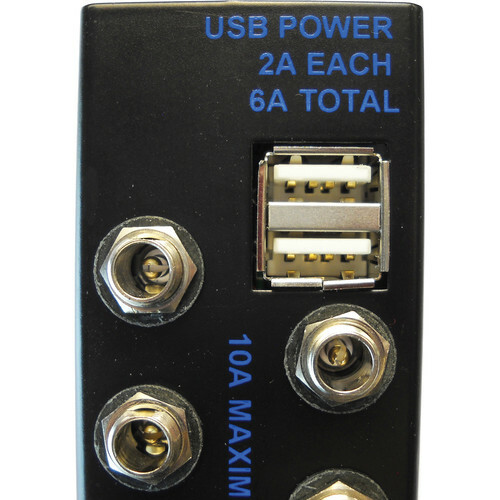 The PowerStar Mini Triple Play has a global (total) current limit of 10 amps. A top panel mounted power switch controls the entire operation. This power switch is a three-way design. When switched to the left, only the USB power outputs connectors will be powered on. This allows continued charging of your USB devices such as an iPhone tm while the rest of your system is powered off. When switched to the center position, everything is turned off including the USB ports. When switched to the right side, everything including the USB connectors is powered on. There is also one connector that is always on and is not controlled by the power switch. This connector is easily identified by the blue ring surrounding the connector. The PowerStar Mini Triple Play features PSC’s exclusive Silent Power Technology™ designed to filter out unwanted switch mode noise and RF interference from your power lines. These exclusive PSC filters will ensure you of clean, quiet recordings in the field by minimizing unwanted inter-modulation noise, RF interference and other noise sources. Our RF filtering will provide better than 34dB of RF isolation between the outputs from 100Mhz to 900Mhz. We are the only company in our industry to go to the trouble and expense of offering this added benefit. Though these filters will not eliminate all noise, they do eliminate most intermodulation noise found in many common power systems. In addition, each of the PSC PowerStar Mini Triple Play’s power outputs are individually Polyfuse protected. Because of this, if one output is shorted, the remaining outputs will function normally. 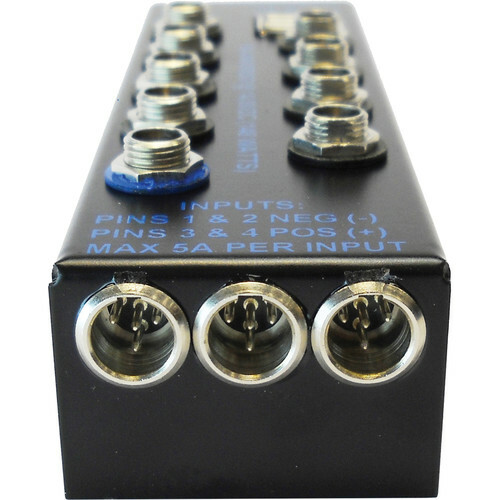 Power input is via three 4 pin mini XLR connectors. Optional NP-1 battery cups, and AC Power Supply and an assortment of PSC power cables are available. The PowerStar Mini Triple Play features reverse polarity protection, genuine Switchcraft tm connectors, a sturdy aircraft aluminum case, tough powder coat finish and a removable stainless steel belt clip with three mounting positions for flexibility in the field.